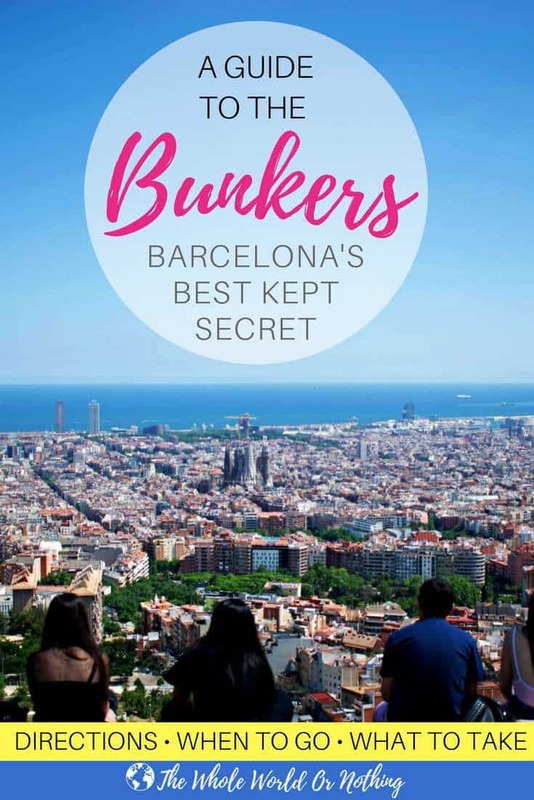 The Bunkers Barcelona is a real hidden gem and it wouldn’t be an overstatement to say it’s quite possibly our favourite spot in the whole of this incredible city. 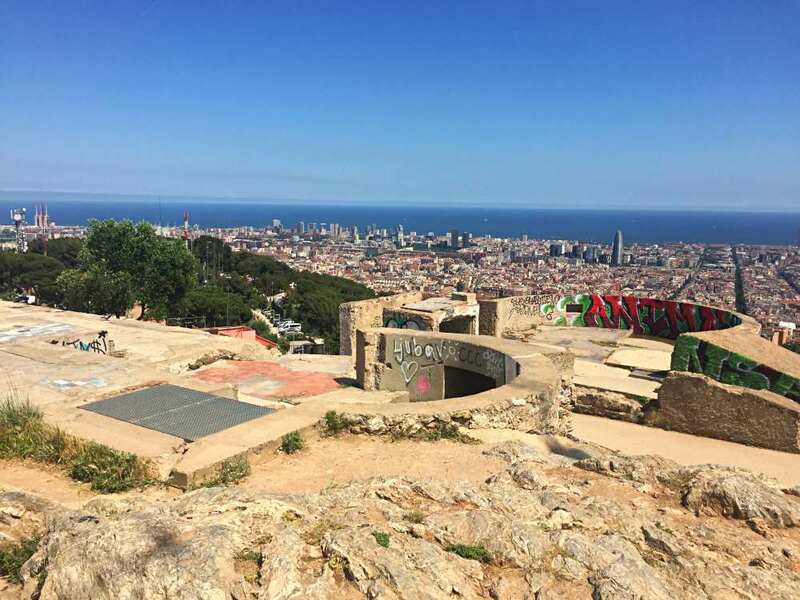 Alternatively known as the Bunkers del Carmel, El Turó de la Rovira, or simply The Bunker, this hilltop hideaway is a truly chilled out vantage point where you can enjoy some of the most epic aerial views of BCN. It’s impossible not to feel awestruck as you gaze over the terracotta rooftops stretching out seemingly endlessly around you. 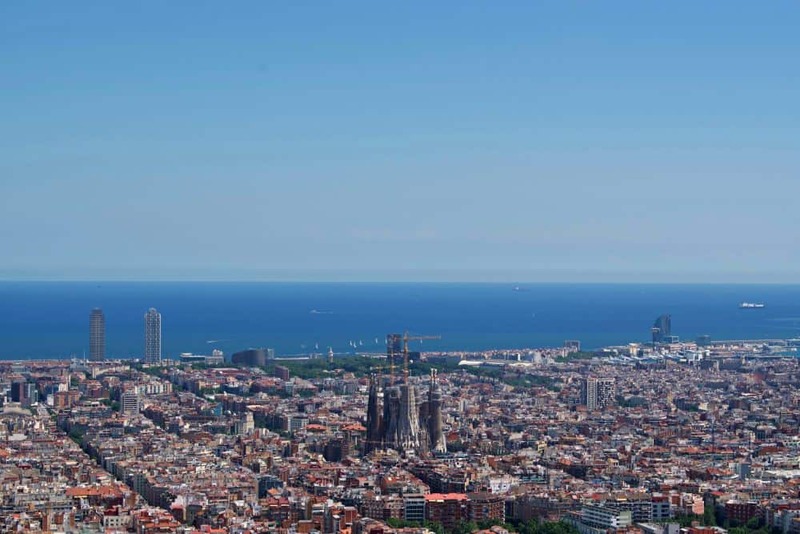 From the peak you can pick out many of Barcelona’s major landmarks including the Sagrada Familia, the Palace of Montjuic, numerous surrounding mountains, plus enjoy sweeping views of the coastline. 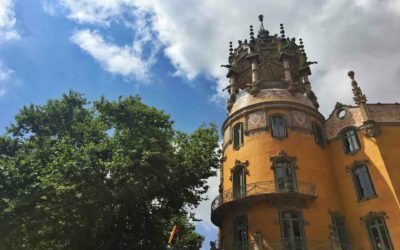 If you’re looking for something a little different to do in Barcelona that won’t cost you a penny then the bunkers are a must. Here’s everything you need to know about their history, how to get there, when to go, and what to do when you’re up there. El Turó de la Rovira is the name of the hill that the bunkers occupy and it has huge historical significance to the area. Probably thanks to the strategic 360 perspective it provides, it has been constantly occupied for hundreds of years. 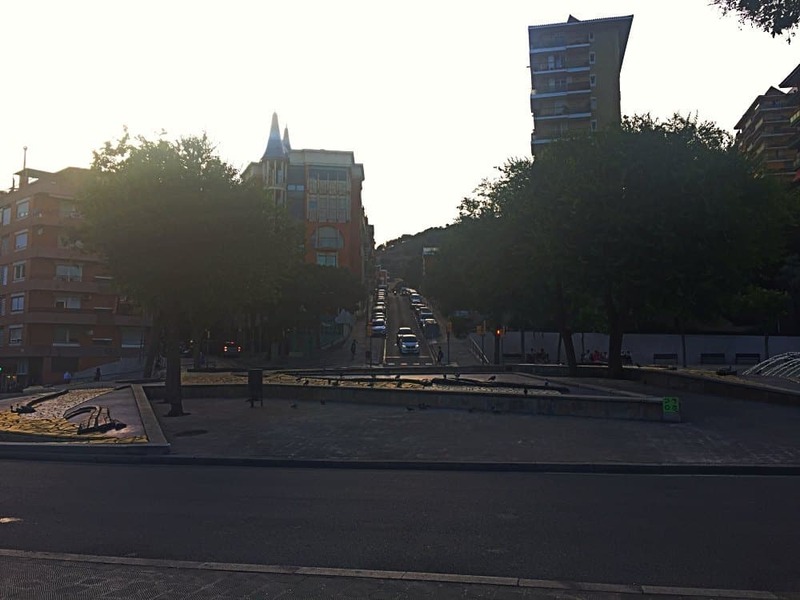 And its those same unique views that made it the ideal place to position anti aircraft weaponry used to defend the city from aerial attacks during the brutal civil war from 1936 to 1939. These days the guns are gone and just the crumbling, industrial looking concrete defenses remain. 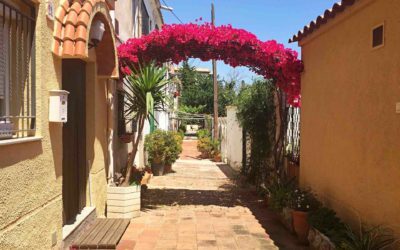 But in the intervening years the shelters were adapted into slum housing and an entire shanty town developed in the surrounding area, at one stage home to 7% of Barcelona’s residents. 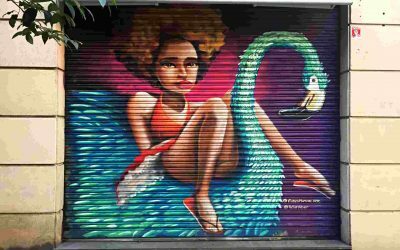 This was only disbanded in the 1990s when the arrival of the Olympic Games prompted efforts to upgrade much of the city led to the Bunker’s occupants being rehoused. Having remained largely forgotten for the following decade, the Bunkers del Carmel began to become popular again in the early 2000s thanks to the unrivalled views they provide. There is also a small museum built into one of the bunkers which was partially excavated, that tells the story of the history of the area. There are various ways to get to the top of the Bunkers Barcelona, but because it’s at the top of a 260 metre tall mound, inevitably they all involve a bit of an uphill slog. Be prepared for a pretty steep climb of up to around half an hour depending on the route you take, how quickly you walk and how often you pause to take in the developing views. Although other guides may tell you that the best metro station to approach the Bunkers Barcelona from is Guinardo / Hospital de Sant Pau, we actually think it’s far easier from Alfons X. They’re both on the Yellow Line 4 but Alfons X is a little closer to the bottom of El Turó de la Rovira where the path up starts. 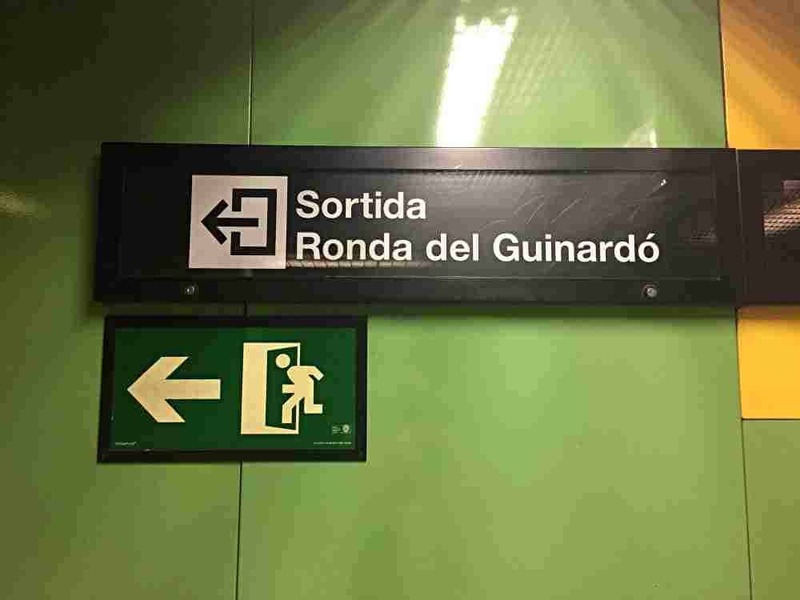 Once you arrive at Alfons X take the Ronda del Guinardo exit. 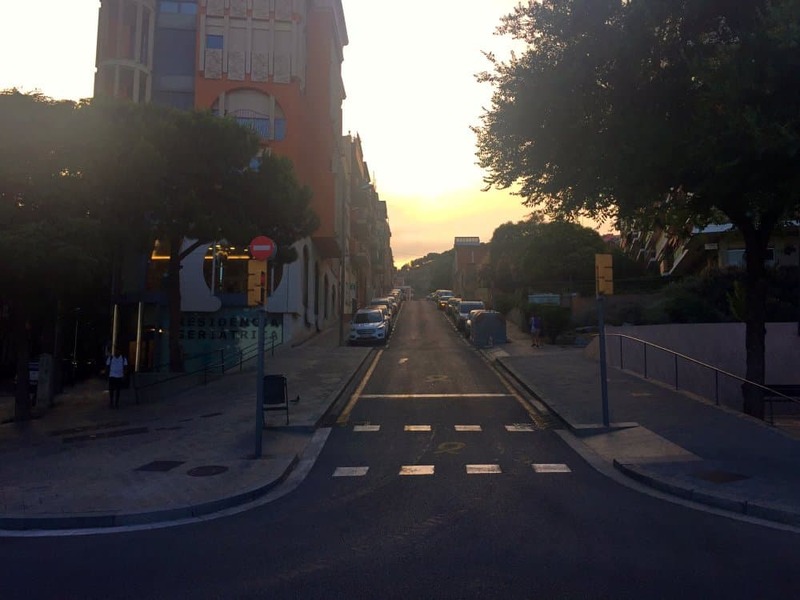 Cross the road that goes down into an underground tunnel and turn left to walk up Carrer de Pere Costa and take your first left onto Carrer de Thous. Walk up here until you come to a funky looking roundabout with a mini water fountain. Walk directly across the roundabout where you’ll come to Carrer de Tenerife which will lead you to the bottom of the steps up to the Bunker, this is where the steep climb begins. You’ll know you’re at the start when you see a large playground on your right hand side with a dirt football pitch, some ping pong tables and a kids play area. 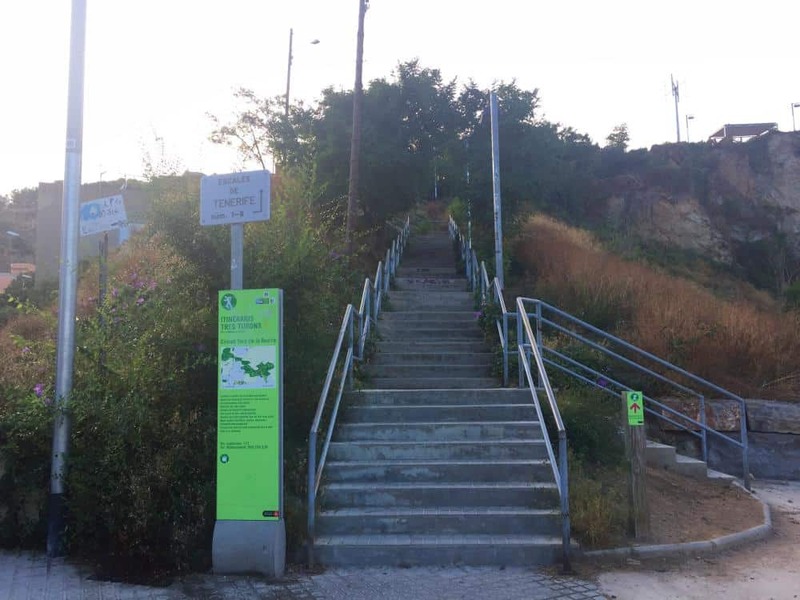 The stairs have a map by the side of them and a sign that says “Escales de Tenerife”, and from here it’s virtually impossible to get lost. Even at points where the path splits into two, it always joins up again so pick whichever one takes your fancy. Towards the top of the stairs on your left you’ll start to see a large metal bridge that looks like a train track, aim for that as you need to walk across it. Once you’re at the other side of the bridge you can see the bunkers above you on the peak of the hill. Now it’s just a case of following the paths that double back up on themselves until you reach it. Along the route up you will more than likely see some graffiti on the path directed at tourists. 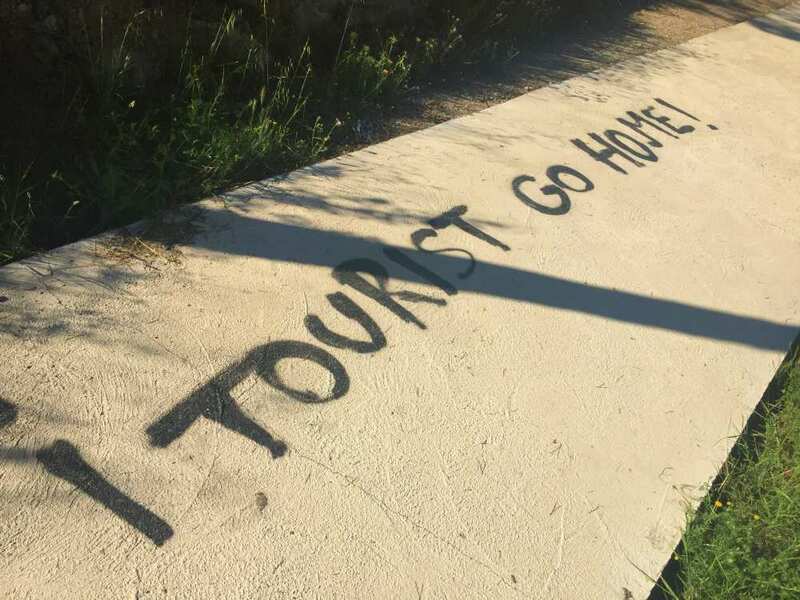 Things like “Tourist go home”, “Tourism kills this city”, and other choice soundbites along those lines. 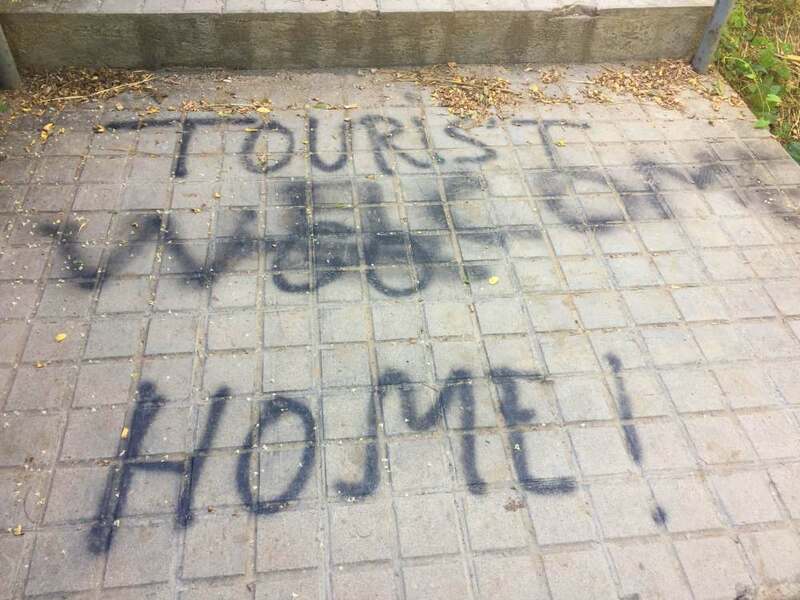 Don’t be put off by this, as while there is a small anti tourism movement within Barcelona, it certainly doesn’t reflect the views of the majority. In fact this kind of graffiti often gets covered up with corrections to make the messages read things like “Tourists welcome”. 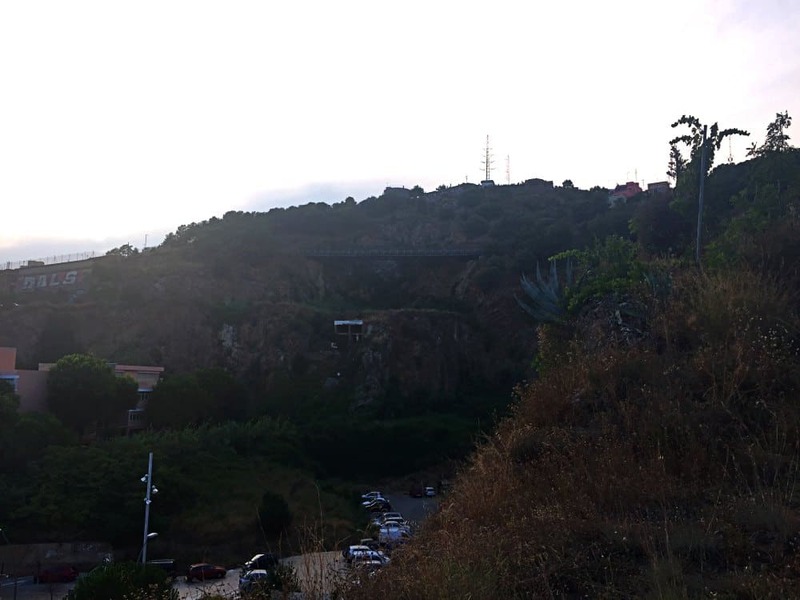 There is a bus that will actually take you far closer to the top of El Turó de la Rovira than any of the metro stations. However, the walk up is fun with the views get increasingly better the higher you go, so if you’re able then we’d suggest walking from the bottom. If you’re not a fan of walking or would find the 30 minute uphill too much then the bus is probably a better option. Catch the V17 from wherever is closest to where you are, you can find out by checking on this map. 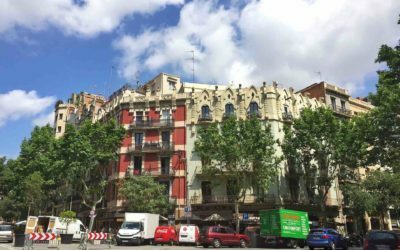 The V17 bus route runs from Port Vell and travels right through the heart of the Gothic Quarter, passing Barceloneta, Urquinaona, Passeig de Gracia, and Gracia itself on its way. So if you’re staying in one of the more popular areas you’re likely not too far away from a bus stop where you can pick it up. 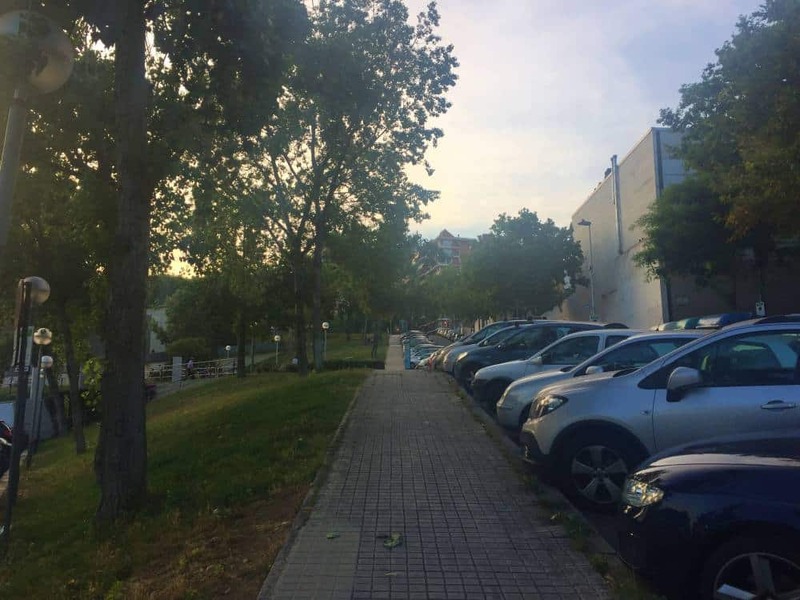 You simply stay on it until the very last stop which is called Gran Vista – Pl de la Mitja Lluna. From here it’s pretty obvious how to get to the Bunkers as there is really only one route up which takes around 10 minutes. The bus approaches the Bunkers Barcelona from the El Carmel side of El Turó de la Rovira, the opposite side of the hill to the one you would walk up. If you’re not a fan of public transport then you can also get to the top of El Turó de la Rovira by taxi. This is obviously going to be the most costly route, and you’ll get dropped off at the same point as the bus would take you to – it’s not possible to drive any further than that. The cost will depend on where you’re coming from, but Uber is available in Barcelona and will be slightly cheaper than a regular taxi cab. 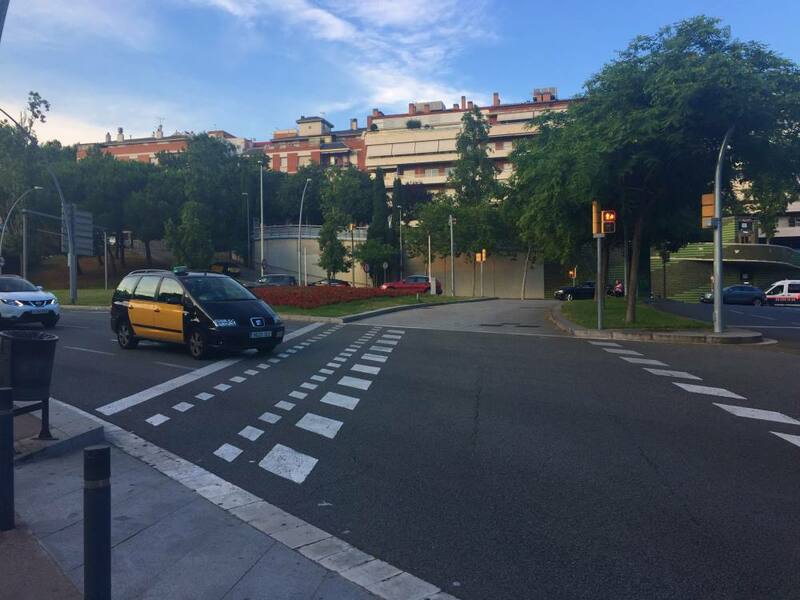 You’ll still have a 10 minute walk to the Bunkers Barcelona once you get dropped off. As above, just head along the only route that goes upwards towards the top. The Bunkers Barcelona are spectacular no matter when you head up there, so don’t worry if you’re short on time or don’t have an option around when you visit. However, if you are able to determine when you go, then sunset is undoubtedly the very best time of day to hit this spot. The city is drenched in a soft, golden light that makes it look even more majestic. Sunset does also tend to be the most popular time for people to go however, and though it’s nowhere near as busy as the top attractions in Barcelona, it does get pretty full. If you prefer to have a bit of peace and quiet on your own then get up there for sunrise instead and you’re likely to have it all to yourself. The Bunkers Barcelona is the ultimate chill out spot in the city, and for us beats even the beautiful beaches that line its coast. 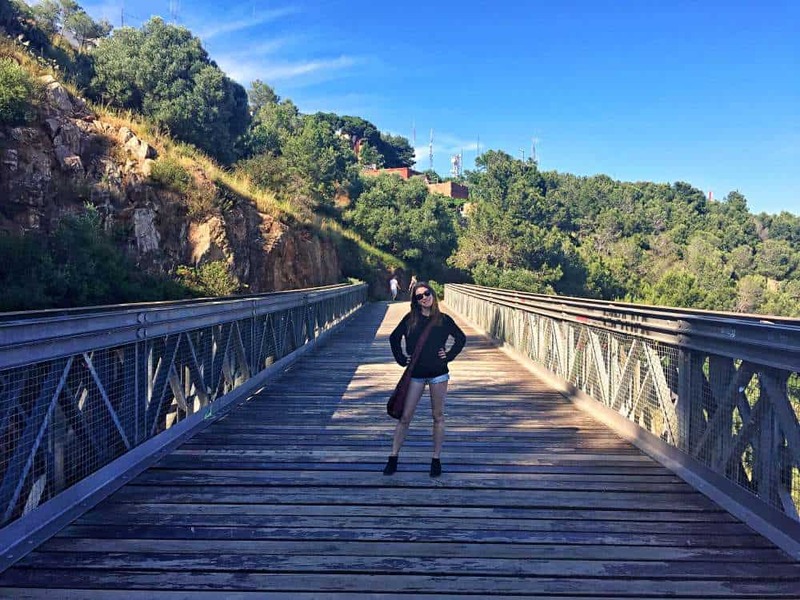 There’s nothing to do here as such, as in there are no attractions other than the views, so don’t expect thrill rides or fountain shows like you’ll find at Tibidabo or Montjuic. This is simply a sumptuous setting to sit back and think about how awesome life is. 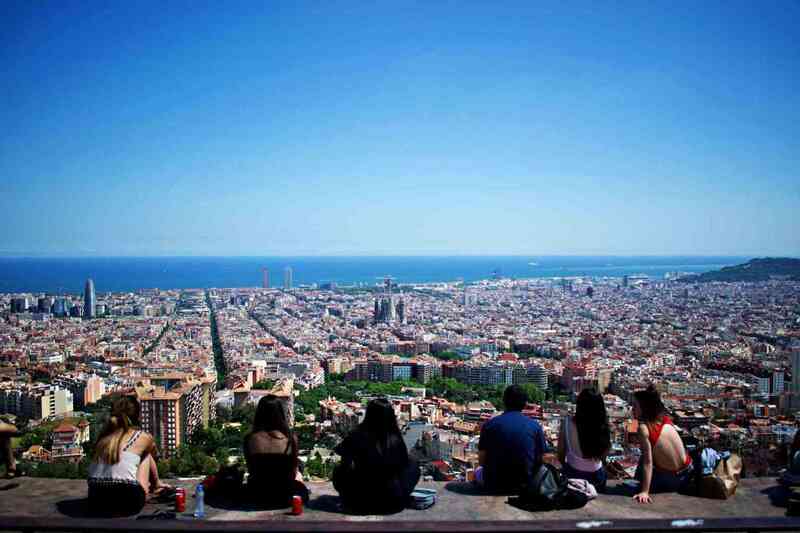 It’s also an awesome thing to do in Barcelona if you are trying to keep your costs down. 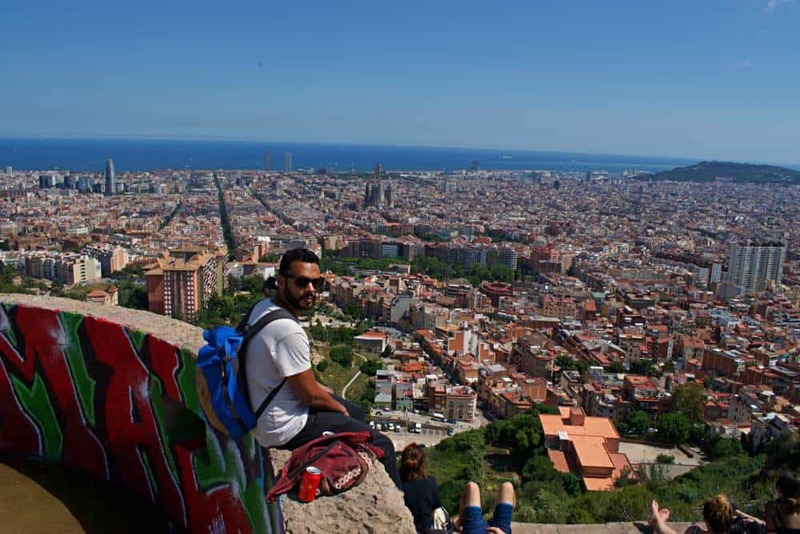 Handy Barcelona tip, take a bottle of cava or a few Estrellas and a bunch of snacks for one of the most picturesque picnics you’re ever likely to experience. Just remember you have to lug whatever you go for up a pretty steep hill, so try not to go overboard. You will regret it. The Bunkers Barcelona have absolutely no facilities to speak of at the top, there’s no visitor centre, no toilets, no shop, nada. Remember, it’s a series of historic bunkers that are no longer in the best of shape, so don’t expect facilities in line with those at the Sagrada Familia (although you do get amazing views of Gaudi’s masterpiece from here). There are a couple of supermarkets outside Alfons X metro station where you can buy some goodies for a picnic before setting off up the hill. You’ll find a few bars around this area where you can have a drink and use the bathroom beforehand or afterwards if necessary. There is usually at least one guy selling beer, water, and soft drinks from a cool box at the top of the bunkers. However, they’re not permanent and not licensed, so they may or may not be there depending on what time you visit. They also charge quite a lot on account of having to lug all of their refreshments all that way. So expect to pay a couple of Euros per drink depending on how good your haggling skills are. 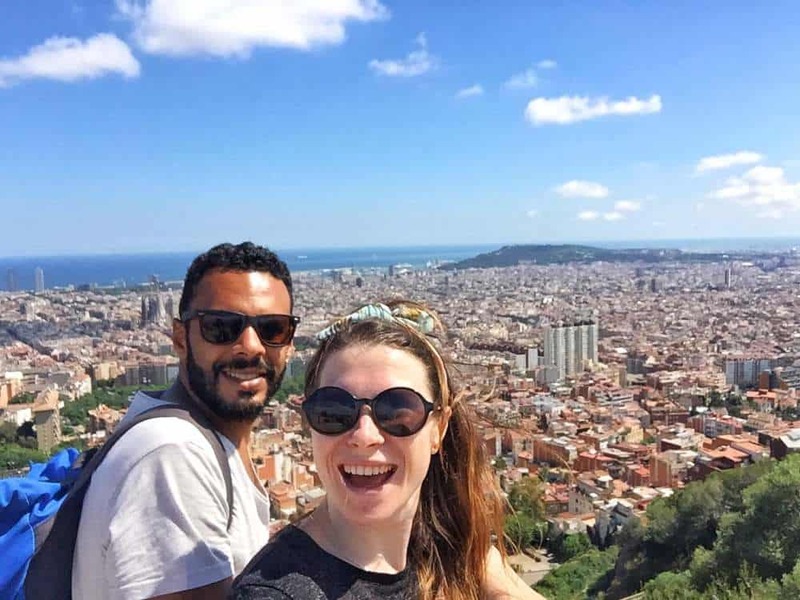 Regardless of how many days you have in Barcelona, if you’re up for a relaxing few hours with phenomenal panoramas then we’d suggest making a trip to the Bunkers Barcelona an absolute priority on your visit to the city. 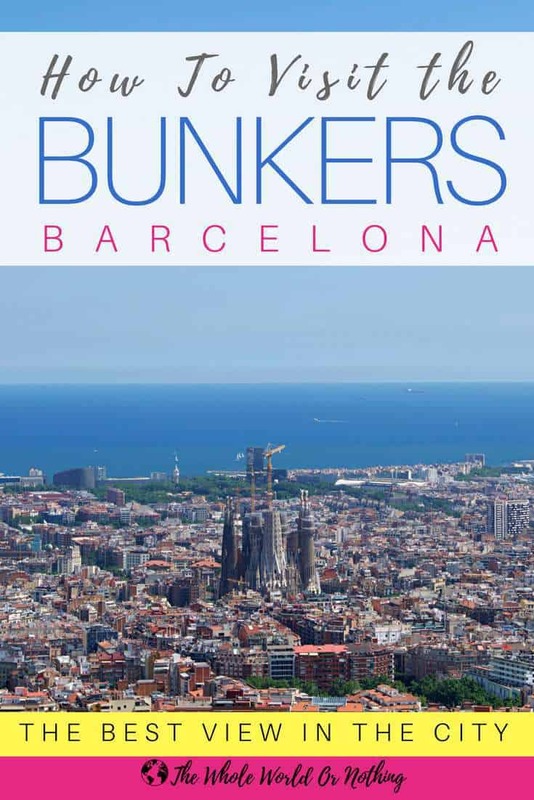 Planning on visiting the Bunkers Barcelona? Have you got anything else you’d like to ask about this lesser known but mind blowing spot? Drop us a note in the comments section below. 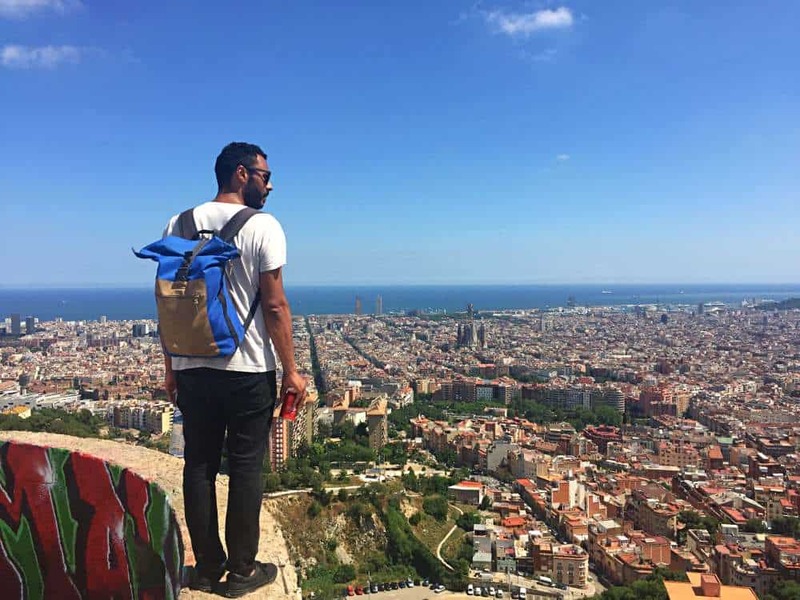 And if you’re looking for another adventurous activity while on your trip to Barcelona, take a look at our guide to hiking Montserrat.